Everyone at Denmark Style has a passion for PANDORA, and we want to share a little about our own stories that our bracelets tell. 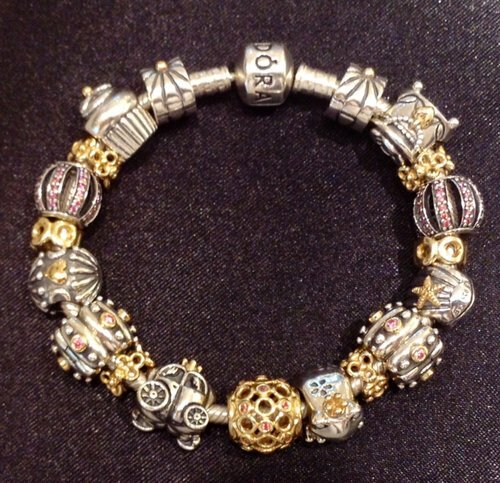 Hopefully you will find the inspiration to create a unique PANDORA bracelet that tells your story. First and foremost I am a dancer, which is the reason why the ballet dancer shoes charm is at the very heart of my bracelet. On either side of the ballet shoes are beads that I chose to represent my grandparents. As a child my Grandpa had a talent for finding four leaf clovers. The clover charm makes me think of him and is positioned to the left of the ballet shoes. After my Grandma passed away last year, I wanted to represent her on my bracelet as well. I chose the everlasting love charm so that I could always have her love with me. To the left of the clover I have the graduation hat dangle to celebrate my recent graduation from college. To the right of the everlasting love charm I have the cow charm because I thought it was adorable, and its smiling face brings happiness to my bracelet. I also have the flowers clip and the "S" clip to hold all of my beads in place, and to give my bracelet more depth. My bracelet is still a work in progress, but I do hope to introduce some color with the pink oval lights. At some point I will also add the Fleur de Lis charm to show my St. Louis pride! Most of the inspiration for my bracelet came from my family. I have the Pandora's Box charm to represent my little sister and her love for fashion, and my parents got me the Loves and Hugs Charm with the 14k gold heart to represent their love for me. The two-tone Sea Shell charm represents where I grew up in Dauphin Island, Alabama. I added the Cupcake Charm with a touch of 14k gold for my 21st birthday. The Royal Carriage charm, topped with a 14K Gold crown, was added to my bracelet for my anniversary. I finished my bracelet off with my favorite charms, the solid 14K Gold Celtic Circles with Pink Topaz in my center, and two Leading Lady charms with Pink CZ's for the sides. Of course to complete the lookm, I added a few 14K Gold Trinity Spacers to make the gold really stand out! View a close-up of Samantha's "Touch of Gold" bracelet. 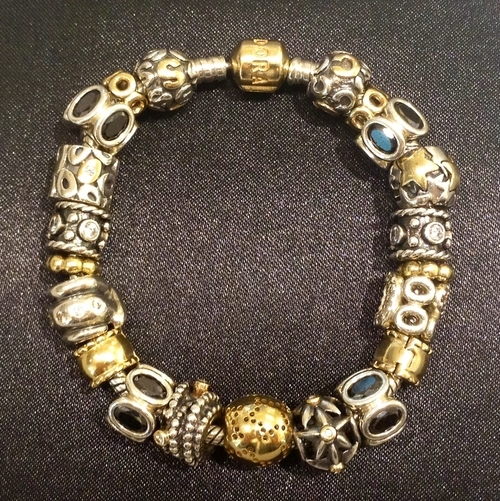 Pairing 14K Gold and Sterling Silver with oxidization brings a look of "edgy elegance" that I wanted in my bracelet. My two-tone bracelet is anchored with its 14K Gold Clasp and two 14K clips. My love of stars is sprinkled throughout, starting with my 14K centerpiece, Starlight. Entangled Beauty, Stella, Circle of Friends, the Oxidized Crown, "Oh My!" and the Champagne Swirl are my favorite charms in our collection adding sparkle, oxidization and texture. I love symmetry, so I placed the charms of similar shape and size opposite each other and repeated the Black Oval Lights (and Oxidized Crown) to create a pattern. Continuing the symmetry I added simple 14K Gold Spacers bringing warmth next to the sterling charms and highlighting the gold in my two-tone charms. My husband's and daughter's first initial with the retired two-tone alphabet beads complete my look with a personal touch. View a close-up of Sarah's "Edgy Elegance" bracelet. "I'll Never Have to Fall Back to Flowers Again"
Like most other husbands, every Mother's Day or Valentine's meant a last minute trip to the florist. Staring a PANDORA bracelet for my wife has helped us celebrate special moments in our lives, and provided me with a wealth of gift options for holidays beyond the ordinary. I started her bracelet off with the three Zen Charms, because she loves classic colors. Her next addition was the pineapple charm, the symbol for welcoming and hospitality, in honor of her enjoyment of hosting parties. To add a touch of gold, she received the Christmas Tree to mark our first Christmas together, followed by the Key to My Heart on Valentines Day, which I am told she receives many compliments on. When she had her ultrasound, and found out we were expecting a daughter, the next day a spacer with pink stones was added, and my wife has shared that she often busied herself or calmed her nerves while pregnant by spinning that bead. The Tree of Life Charm was then added when our daughter arrived to celebrate the extension of our family. The gift options have truly been endless and continue to surprise her. My wife loves her bracelet, and since she can use the beads as a necklace as well, she appreciates the flexibility in how she can wear them. Thank goodness I'll never have to fall back to flowers again!